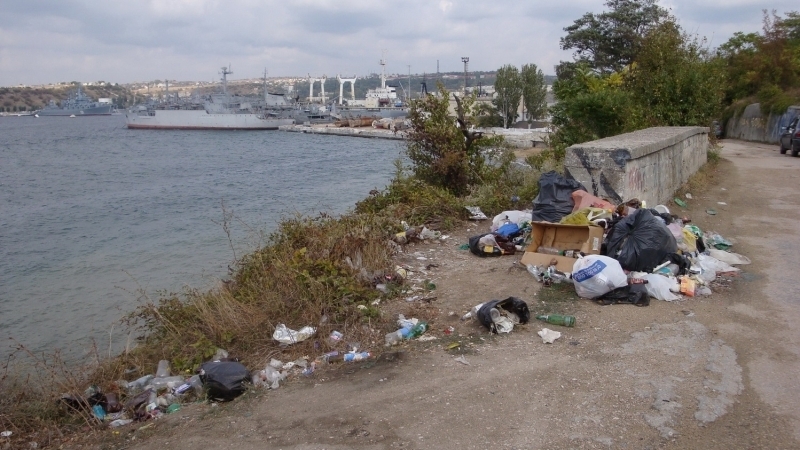 In the occupied Sevastopol the garbage is not taken out from the beach of the National monument of nature "Ushakov balka", the local media reported. “On the beach of "Ushakov balka" litter-box are full and garbage is piled near them. I, as a resident of this district, am ashamed both for people who are littering in this place, and for power that does not provide timely removal of garbage. From the neighboring houses one can see that the road to the beach has been repaired, but the garbage spoils the impression,” said Maria Kornoukh, who sent a photo to the newspaper. Reference: Ushakov balka is a monument of nature of local importance with a park and a number of Red Book species growing in it, and the aqueduct, near which local residents store garbage, is a historical monument. Earlier QHA informed about the problem with garbage collection in occupied Simferopol. Reportedly, representatives of public organizations in the annexed Crimea are outraged by the expansion of landfills near the settlements of the peninsula.